* Please Note: The fireplace's Middle Width must be at least 22.5 Inches and the Depth must be at least 14 Inches for this gas log set to fit. You can calculate the middle width of your firebox by measuring the width (left to right) approximately half way back in the firebox. If you have any questions, please contact our customer service department and we will be happy to assist you in finding the perfect size gas log set. The Empire Sassafras Refractory Gas Log Set with Slope Glaze Burner provides a lovely atmosphere for your family room or den. The Empire Sassafras logs look like logs freshly cut. 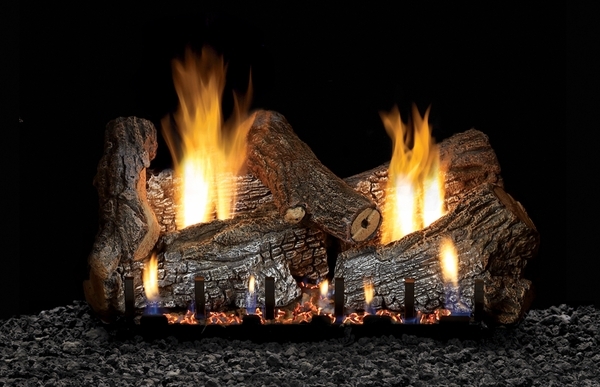 The Empire Slope Glaze burner creates lifelike flames that accentuate the lifelike look and appeal of the logs. The combined physical features of the logs and flames add to the atmosphere of the fireplace. The options that come with the burner, of either natural gas or LP and manual or remote control, add to the general appeal of this product.